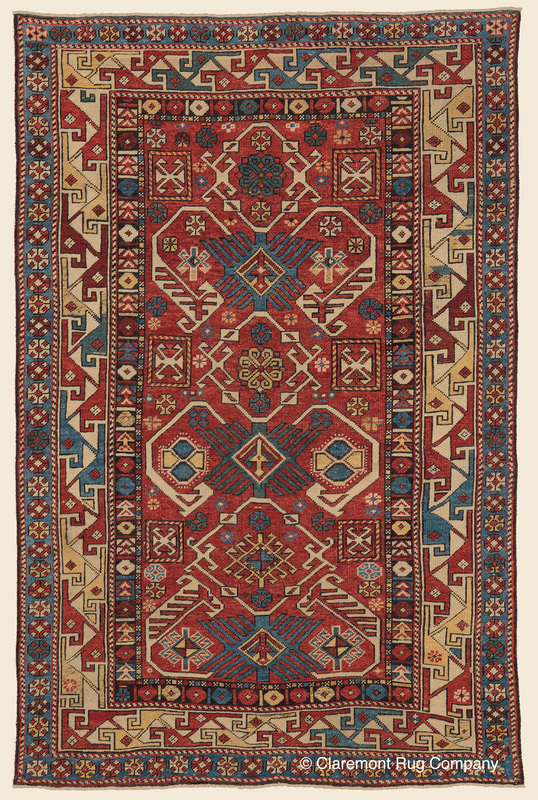 Search Our Inventory / All Rugs / 3&apos; 9" x 5&apos; 8"
3&apos; 9" x 5&apos; 8"
(High-Decorative) An excellent example of one of the most seldom encountered Caucasian subgroups, this over 125-year-old Bidjov Shirvan offers an inspiring palette of saturated dyes and a clearly rendered, deeply intriguing design. Its warm and vibrant coral-hued field features a plethora of elemental, hand-drawn tribal motifs with dramatic ivory accents. The masterful display of exceptionally nuanced abrash (intentional color striation) creates a sense of great visual movement and depth. The diversity of geometric ornamentation is even more dramatic along the field's margins, where an exquisite array of octagonal rosettes and diminutive forms appear in well-spaced profusion. Painstakingly colored polygons fill the secondary borders, with narrow red and white guard stripes dividing each section (INQUIRE ABOUT THIS RUG AT CLAREMONT 2, 1-800-883-1815).